The Catalyst NEWS April 23, 2003 Teach-In brings multifaceted discussion of war by Caitlin Young The Hamilton Center Fi hbowl was flooded April 15 with students and community members interested in discrimination, peaceful resistance, and how to deal with the repercussions of the war on Iraq. Nearly 1 00 people showed up to hear the speakers including community leaders, professors and students. The event was organized by fourth-year Robin Jacobs. The speakers all agreed to come for free, though the SAC did provide money for snacks and flyers. In general, the Teach-In was about how the American war on Iraq-and even before that the Sept. 11 incident has made significant impacts on domestic and foreign fronts. The event also tackled the serious discrimination and legal harassment Muslims and Arabs are facing in the U.S. Recent disregard of international opinion has set a disturbing precedent, causing some to ask the question of who polices the U.S. Additionally, Amnesty International is looking into allegations that the U.S. has been committing war crimes, but is not stepping forward to prosecute those involved. Current generalizations "devastating effect on Arabs Muslims in this community," said speaker Nina Burwell, former president of the Interfaith and Interracial Council of Sarasota and Manatee Counties. She currently works with an at-risk youth group called "Yes We Can." Discrimination against Arabs and Muslims is an ever-growing problem. Burwell cited many examples of racial hate, and called for people to realize that what they're doing is unfounded and wrong. "Why do we single out people who are easily separated out by appearance?" Burwell asked. Arabs and Mu lims "came here for what the American flag stands for: democracy." What they get now is hatred, according to Burwell. She also pointed out that minorities cannot mobilize and voice their opposition to the war because they fear repercussions. "If you live in a society where there's so much distrust that you never know if INS is going to be waiting for you when you leave the store, you can't afford to come out to events like this," she said. "It's dangerous." Non-violent soulforce Many students had met Reverend Don Thompson before. Most recently he was part of the sit-in at Sarasota-based Congresswoman Katherine Harris' office. He has been active in non-violent protest since 1965, when he studied under Dr. Martin Luther King. Thompson wa dressed in a blue shirt with the traditional clerical collar and holding Stride Forwards by King in the same manner as a preacher holds a Bible. His message was for "non violent soulforce," which he defined as different from pacifism. It's "a soul spirit force to make change," according to Thompson. It's about ubmitting yourself to possible physical harm or arrest because you oppose that which is unjust." First-year Gustavo Oliveira asked what Thompson thought could be done in the current situation. "We were not able to stop the Iraq war," Thompson replied, "and we may not be able to stop the Syria war, but we have to deal with this massive greed, militarism and racism." Thompson urged students to get involved with electing politicians and keeping them on the right track once they're in office. He charged many politicians with being "Dixie-crat Democrats," or nearly the same as Republicans. He highlighted his grandmother, the first woman elected to the New Jersey legislature, as an upstanding example of honest "Who's going to take us to task?'' third-year Gigi Shames asked Travis McArthur, a student representative from Amnesty International. He was there to touch on a few points about international law, specifically the Geneva Convention of 1949, but was unable to come up with any real answers. Over 4,000 civilians have been killed due to cluster bombs from the Gulf War. Use of the bombs is considered a war crime because it causes "superfluous civilian deaths." Charges have been made that the U.S. is using cluster bombs in Iraq. There have also been allegations that U.S. attacks on Iraqi media have been improper and were in an effort to keep local news from being broadcast. The civilian situation in Traq is in chaos. Looting is widespread, Red Cross supplies in ho pitals are being stolen, and army distribution of food is not getting back to women and children. "What's becoming increasingly clear is that the humanitarian situation in Iraq is dire," McArthur said. There was a table set up in the back of the Fishbowl with information and pre-written letters of opposition to U.S. Defense Secretary Donald Rumsfeld for people to sign. Student Interpretations Local voices were added by thesis student Casey Burns and third-year Ben Wright. Burns spoke first, adding analysis as a political science major. One of the most remarkable things, according to Bums, is the Bush admimstration's ability to completely change what people care and talk about. Additionally, they have brought the issues and vocabulary down to the lowest common denominator, making argument nearly impossible, he said. "It's good versus evil now. You can't say 'yeah, I'm pro-evil,'" Bums joked. The new trategy of ''shock and awe" campaigns is "sort of the blitzkrieg of the modern era," he said. ''We just beat up on a third world country that never really put up a fight." While first-year Blake Weinger said that Burns was "seriously underestimating the serious resistance in this country," Bums rebutted that "the majority of the students are like the majority of the country. It's not that they don't care, it's that the rhetoric has worked so well." Wright looked at the situation through a sociological lens. He analyzed the current administration, and how in many ways it's just a continuation of the first Bush regime. Wright's resentation was marked m. community members. Sarasota resident George Arvay spoke up in defense of Wright and called for no more interruptions. Arvay, originally from Hungary and having lived for everal years under both Nazi and Communi t rule, in erted several comment throughout the evening. He cited many historical situations and mentioned how the present is beginning to show frightening similarities. Nathaniel Second-year Ben Wright was one of two students who spoke. A Historical Look The history of war and the Middle Eastern region was History Professor Lee Synder's topic. He also philosophized about America's goals and its fitness as a role model of democracy. "How do we think we can teach others how to run a country when we have so many problems here?'' he asked. 'We (Americans1 say we want to give that civiliiilfoit. for the most part, developed in the Middle East thousands of years ago, with no help from anyone. "Why should they give [their culture] up to become Europeanized?" he asked. He also raised the question of America's intents. Is the point to help "enlighten" those countries, or i thi a more subtle version of colonization? "Why shouldn't we?" he joked. "It's the American destiny to control the world." -+ Identifying the causes of writing anxiety -+ Managing writers -+ Moving beyond perfectionism, procrastination, and paralysis Refreshments wiU be provided. For more info .. 359-4506. The Catal NEWS 2003 Fulbright scho ar rmocida to teach Students offer support to women-at health clinic Katelyn Weissinger Fourth-year Jennifer Arrnocida from page 1 is one of three ew College tudent who won a Fulbright group often smiled and said It's your right," as Fellowship this year. The award women entered the Center. will allow the Literature major to The similarities between each group's approach teach English at a high school in and method ended here. Germany next year. Armocida i New College students held homemade banners one of about 1,000 Fulbright bearing slogans such as "Honk if You're Pro-Choice" cholars awarded internationally as they greeted people entering the Center and struck this year and one of two New dramatic poses and gyrated their hips playfully before College Fulbright winners traveling ongoing traffic. to Germany. Before departing, The pro-life activists held up large, professionally Arrnocida will present a thesis on made color banners bearing photographs of aborted the book Patterns of Childhood by fetuses. Some participants loudly read passages from Christa Wolf. the Bible denouncing those who showed indifference Armocida will spend twelve towards the plight of the powerless. hours a week working as an 'We're very unsophisticated compared to them," assistant to an English teacher. She FMLA and Vox member first-year Charis Stiles said. hopes to go to Berlin, where she "They have huge signs of mutilated children, and studied German last mnmer. She pamphlets, and everything prepared, and t:Wngs that spent a month in Berlin through a they've been saying to people for fifteen years, and language program at the Free courtesy we just have signs we made that morning saying 'ProUniversity. Choice.' I feel on a social level we're more prepared, Jennifer Armocida will teach English in Germany next year. b th d d d d 11 d d Armocida began taking German ecause ey re ru e an ern e an JUSt ye an on t classes with Professor Glenn She's not proficient in German, but to get along just fine. make good arguments and say incredibly horrible Cuomo when she came to New Armocida, from Dayton, Ohio, she is self-conscious about being an things." College. Armocida is slightly is excited about the possibility of American in a country with strong Other New College students had similar worried about the language barrier; returning to a big city like Berlin. anti-American feelings. sentiments regarding the pro-life protestors. S is also looking forward to .... "[The mother seeking an abortion] already knows supposed to be teaching them English, so within that Sphere it should be okay," said Armocida. Armocida hopes to discuss American current events, politics, and culture with her new students. She also wants her students to do some creative writing, which she believes is under-taught in European high schools. Armocida plans to attend graduate school after returning from Germany i j a c in.tbe teeth "[The food in Germany] was answer me in English because they for her for [the pro-life protestors] to 9e screaming at great. I'm a vegetarian so I didn't could tell I was an American," said her at that point," Johnson said. "She already knows eat any of the weird sausage Armocida. "I remember this man the options and she's decided against them." concoctions ... I basically ate bread from Iraq came up to us--I was Pro-life protestor J.L. Jackson expressed what and cheese, but it was the best with a group of Americans-! many of her compatriots felt was a lack of infonnation bread and cheese ever," said remember him and a lot of German regarding the consequences of abortion. Armocida. "The people were people asking, 'Why are you doing ''Nobody ever tells what (the women who get reserved at first, and I like that this?' or 'Why do you have that abortions] are going to have to deal with afterwards," about their culture because I'm president?' I didn't know they Jackson said. "Nobody tells them about the emotional reserved at first, too." would see me like that but I don't pain, and the counseling necessary afterward. A lot of Although Armocida is think they necessarily saw me as them are young, unmarried, and don't feel like they enthusiastic about going abroad, responsible for America." have a choice." What will YOU do +AIRPORT+ SUIDIDeril e'll help vou make plans! www.ncf.edu/CareerServices FREE resume/CV writing consultations. Career planning. Job search strategies. Jobs. Mock interviews. Study .abroad. Graduate schools. Fellowships. Scholarships. Volunteer programs. Summer activities. Calendar of events. omce tea Palmer Building E, 359-4261 Monday-Friday, 8-5 d s MI STORAG Units as low as $21.00*/month l.t:x:oted off U.S. 41 2 tmffic lights north of New College at 455 Broden Avenue Office 941-355-5559fc Hours: Mon-Fri 9-6 Sat 9-5 ACCESS 7 DAYS A WEEK 7 A.M-9 P.M. INCLUDING HOLIDAY WE HAVE THE LOWEST RATES FOR SELF STORAGE ANYWHERE. psssstttt!!! beat the "Rinoling" crowd ... DON'T WAIT TIL IT'S TOO LATE!!! 3'wide x 7'deep x S'highstandard unit plus sales tax ;a one time $5.00 admin. fee. Other sizes ava1lable. 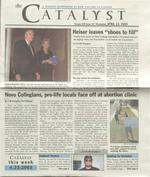 The Catal st NEWS Any way you slice it, Heiser takes the cake Heiser last week, at appreciation ceremony in Heiser searching for New College's pennanent President. his honor. He chaired the search cornmiHee for almost two years. Heiser the patriot. Before New College, the General served as Anny Chief of Staff in Europe under Gen. Alexander Haig. Heiser's bronze gree1s students and visitors to the natural sci ence complex named after him. I continued from page 1 official capacity on campus, General Heiser brought a real human dimension to his role on this campus. I think we have taken that for granted," President Gordon Michalson Heiser's reach extended far beyond the New College community. "The one thing that I wish students would do as well, is not just thank him for what he did for New College, but thank him for what he did for this country as well," Blaweiss said. A monumental moment in New College history 'The retirement of General Heiser is a tremendous loss. You can only think of this as a monumental moment in the history of the college," Michalson said. Nevertheless, the New College Foundation is embracing change,and trying to take the Foundation in a new direction. 'The needs of the college are increasing, the complexity of the environment is growing. I think we have to be flexible and not just lock into something. On the other hand, the function of the Foundation is to raise money to enable New College to fulfill it's mission. To provide the where with all, that comes first and foremost, but how you do that, where you do that and with whom you do that should be open for all sorts of creative interpretation," Foundation Trustee John Cranor ill said. "We couldn't have had a better advocate. I think his advocacy role and that rock-solid person who has been here throu h thick and diin is w at his legacy is all about." New College President Gordon "Mike" Michals on ''My advice for New College is to keep progressing in the academic world and continuing to build our academic reputation,," Heiser said. He believes the Foundation should have a crucial role in this process by providing private funds to the coJlege over and above the state, which can be used for enhancement In the hands of Cranor and Foundation Executive Vice President Jim Harman the New College Foundation hopes to "stay the course" by supporting the enhancement of New College as much as possible. What about Heiser's future plans? ''I guess I am looking up to not getting up early every morning," he told The Catalyst. Looking for big feet "I have gotten into the habit of saying that we are not going to replace General Heiser [as Foundation President] for the simple fact that he is irreplaceable," Michalson said. While the administration acknowledges the retirement of Heiser is a "tremendous loss," they are quick to point out their optimism toward finding a successor. The search process for a new Foundation President and CEO is underway and expected to be completed by May 15. The search committee overseeing the process consists of Cranor, Harman, and Vice-President for Finance and Administration John Martin. ''It would be an honor for anyone in this country to come lead that foundation and raise money for this place," Blaweiss said. The committee placed an advertisement in the Chronicle of Higher Education, The Chronicle of Philanthropy and the Wall Street Journal. So far they have received over 190 applications for the position. Cranor believes the overwhelming response stems from the "public/private partnership that just does not exist anywhere else. This is a very unique situation." The committee is reviewing each application in order to create a short list of 12 candidates to present to the 10-member Thursday. This Jist will be narrowed to a short-short list of two to four candidates, who in turn will be invited to campus for an extensive 24-hour interview process. The final candidate will become Foundation president on July l. In the meantime, Harman will temporarily assume the position. "I think there are some wonderful opportunities here and some great challenges, no doubt about that. I really am looking forward to my role, no matter how brief it might be," he said. After a permanent president is selected Harman will return to his former role as vice-president. In selecting a new Foundation characteristics that tbe comniittee will take into consideration. 'They have to have an intellectual leadership capacity, creativity, ability to raise money, bias for action and the ability to interact with different constituents. 'Those are the basic qualities for which we are looking," Cranor said. "I am only looking for people with big feet because they will have big shoes to fill." photos tltis page b) athaniel Burt>ank : CoU ge FoundatiOn Heiser attended more than a few groundbreaking cere monies on the New College campus. Most recently, he helped kick off the new Keating Center. Left to right: Board of Tnl!.tees Chair Bob Johnson, Heiser, benefactors Ed and Elaine Keating, and President Gordon Michalson. izza Pros (Formerly Domino's) 2801 N. Tamiami Trail (941) 358-0020 or 0023 NEW COLLEGE STUDENT MENU 14 INCH "LARGE" 16 INCH "XLARGE" one topping $5.50 one topping $6.50 additional toppings $1.00 over 5 toppings: Large $10.50 XLarge $11.50 2nd pizza (of equal or lesser value): Large $5.50 XLarge $6.50 also available: CINNAMON BREAD $1.99 CHEESE BREAD $ 3 .50 CHICKEN WINGS (10) OR STRIPS (5) $5.99 DRINKS (PEPSI, DIET PEPSI, MOUNTAIN DEW): 12 OZ. CAN $.75 2 LTR. BOTILE $1.99 FREE DELIVERY .OPEN DAILY 4PM-MIDNIGHT Delivery or Carryout 358-0020 OR 358-0023 We gladly accept v1. I --:--" ,., Masl i : "'h -l. "' $' -, ... --------EARLv BIRD SPECIAL PIZZA AND WINGS 1 TOPPINGS GALORE 1 PM $2 99 1 LARGE 2-TOPPING PIZZA 99 .. 1 LARGE UNLIMITED 15 99 CHEESE PIZZA 1 LARGE 2-TOPPING PIZZA 1 & 1 ORDER OF WINGS I 1 ORDER OF GARLIC BREAD I Carryout only. Mut prehnt cou114" Hot valid with any olhllr offer. Explrn 4/29/2003. Must present coupon. Hoi valid with any other offer. Expires 4/29/2003. Must present coupon. Mot valid wllh any other offer. Expires 4/29/2003.